Describing Jermaine's artwork, the paper stated: “Jermaine came up with the perfect image: A still strong, but clearly concerned, Uncle Sam who is reaching out to the viewer for help. Uncle Sam is an iconic image instantly recognizable to Americans as the bold star of J.M. Flagg’s 1917 poster, which was used to recruit soldiers for both World War I and World War II. 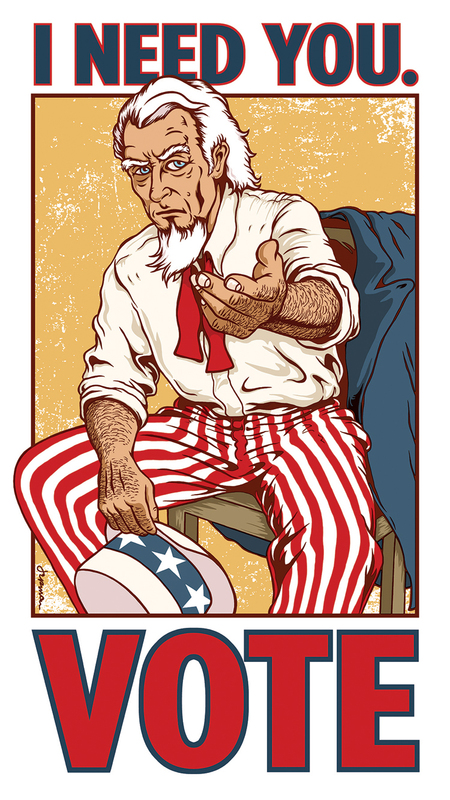 In that artwork, Uncle Sam is resolute. He knows what he wants and he doesn’t hesitate to ask for it. “VOTE” by Jermaine Rogers x USA Today is a 26”x15” signed and numbered screen print. The Regular Edition was printed on Stardream Opal gallery stock with rich inks, is part of an extremely limited edition of only 75 copies and will retail for $60. The Lava Foil Variant is limited to just 20 pieces and will retail for $100. Both go on sale at 2pm CST today, Monday, November 7th, at the Jermaine Rogers online store.